This is an excellent piece of machinery that would enhance any office. Its quiet, speedy and the document feed is very forgiving. Tradescanners sales advice was informative but not pushy and the aftersales technical help first class! Cannot praise them enough. 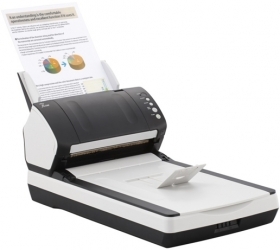 Attach the Black Document Pad to the flatbed to make scans with a black background. This enables the scanner to apply image processing like size detection and skew correction to a document scanned with the flatbed so that the resulting image data is properly sized to the original.